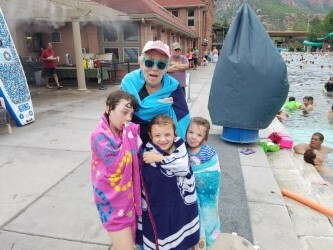 A couple of weekends ago, my mother and I took my three girls to Glenwood Hot Springs. For those not from the Colorado region, Glenwood is a massive sulfur smelling pool surrounded by shops that boast offerings from ice cream to rubber dog poo. This is the third or fourth year I have taken my daughters to the hot springs and it is now a trip they look forward to it every year. 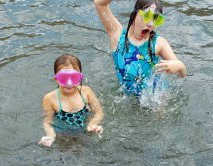 It got me thinking, a good part of the reason I take my girls up to Glenwood is because it was an annual trip that my family took when I was a kid. I’m not necessarily a sucker for tradition but it is among my favorite childhood memories. Not that having three kids in a pool the size of several football fields afforded me a ton of time to reflect, I was able to afford myself a minute here and there to dwell on my less-gray-haired days. I think the main thing I noticed, outside of spending a great family weekend and reliving memories, was that everything seemed to take longer back when I was a kid. For example, the drive to Glenwood takes about four hours, maybe three and a half with me behind the wheel. This weekend we left home around six in the morning and were in the pool well before noon. When I was a kid, it was an all-day adventure. Like so many things about my youth I think I am misremembering the details of these trips, but I’m sure that Glenwood was easily twelve hours away when I was a kid. I’m not saying that they moved Glenwood, but I’m not conceding that they didn’t either. Then there were the lines, the lines to the slide, the diving, hell, the line to get in the door of the pool always seemed daunting. I listened to my daughters complain about the line for the slide on Saturday. They were gone for no longer than fifteen minutes. I’ve waited longer than that for a cup of coffee. But it wasn’t just the bad things that seemed to take forever. 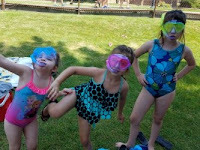 I remember the water slide taking an entire lunch break to get down, but my girls rode it for twenty seconds at a pop. Side note, the price per ride seemed like a much better deal thirty years ago. The soft serve seemed bigger than my head, the days seemed to last forever and the weekend seemed to be about six days long. I’m not quite sure why that is. Maybe the world just moves a little slower when you’re a kid. Maybe it’s a little easier to stop and smell the roses when you aren’t thinking about mortgages and getting kids to soccer practice and work and making ends meet. Whatever it is that slows time down, it has also erased a lot of the not so great things that Glenwood brings. Long gone from my memory was the sunburns, the chafing, the red eyes and getting dunked by my brother. Three of the items on this list reared their heads this weekend, you’re welcome little ladies. Long gone are the car rides and the construction in the canyon. Long gone are the smashed PB & Js and the seemingly always damaged rafts. When all the little nuisances get stripped away, I suppose what is left is a childhood memory worth passing on. So here it is girls, the point of today’s diatribe. It’s something I’ve been working on in the days since. Stopping and smelling the roses should be a way of life. As you grow up you’ll find yourself racing through days, looking towards goals down the road failing to see what is right in front of you, that there is a lot of beauty in the ‘now’. Sure the construction in the canyon made those childhood drives to Glenwood really long, but it’s when my sister and I threw rocks into the river while we waited for traffic to start moving. Of course red eyes and sunburn hurt a little, but they were earned in the hours I spent playing with my siblings from sun up to sun down in the springs. Life is short, and it gets even shorter when you are constantly looking down the road. This one is a lesson I need to take to heart as well. Speaking of which, your cousins are just waking up so this post will be cut short and less than edited. Living in the ‘now’ so to speak.